with a bright high sound off the head whether played in the hand-held or on-the-knee position. 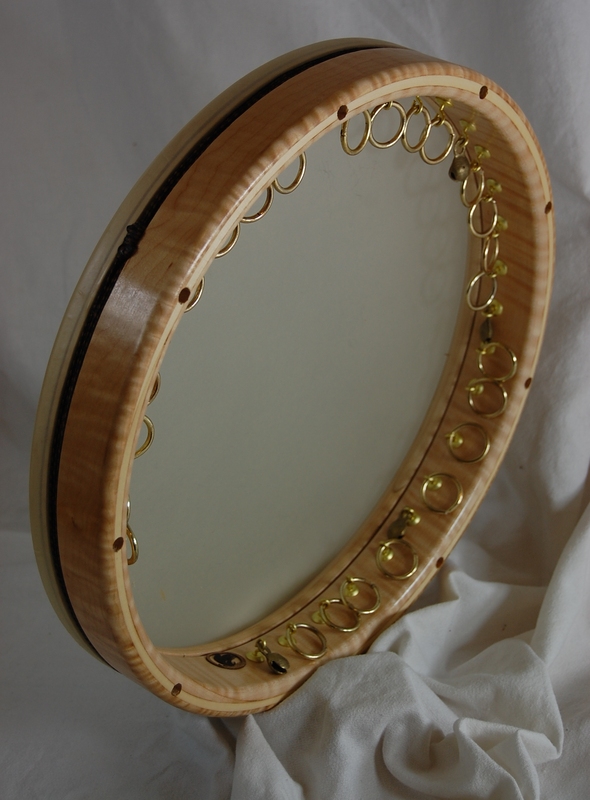 Our CLASSIC GHAVAL shell, a turned maple frame with a decorative exotic wood outer flitch, is 13 3/4″ in diameter, 2 5/8″ deep, 1/2″ thick. This shell features a precision turned bearing edge, and a rolled bottom edge to reduce stress on the player’s finger joints. We’ve fitted our Classic model with 24 brass rings, divided into 6 groups, each beginning and ending with a small pellet bell. 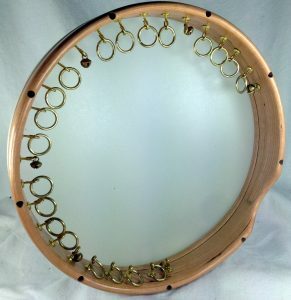 These rings and bells are mounted on small hooks so that they make contact with the wood shell, but not the head, and so avoid any unwanted buzz sound. A half-moon arch cut in the shell at the 6 o’clock position allows for ease of play with both hands. This design also enables a stable grip for the less traditional playing style, where the ghaval is held flat (like a pandeiro) in one hand and shaken back and forth, so that the rings hit the inside of the shell in rhythm, while the drum is playing with the other hand. 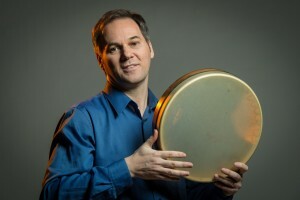 Remo’s warm, responsive Renaissance head is recommended. We secure the head into an exterior groove which is then covered with a colored knit cord, a design that minimizes the tendency of the head to pull away from the shell. Natural skin heads are available upon request. Our Glen Velez Handance Ghaval offers players a lighter weight version of the Classic model. 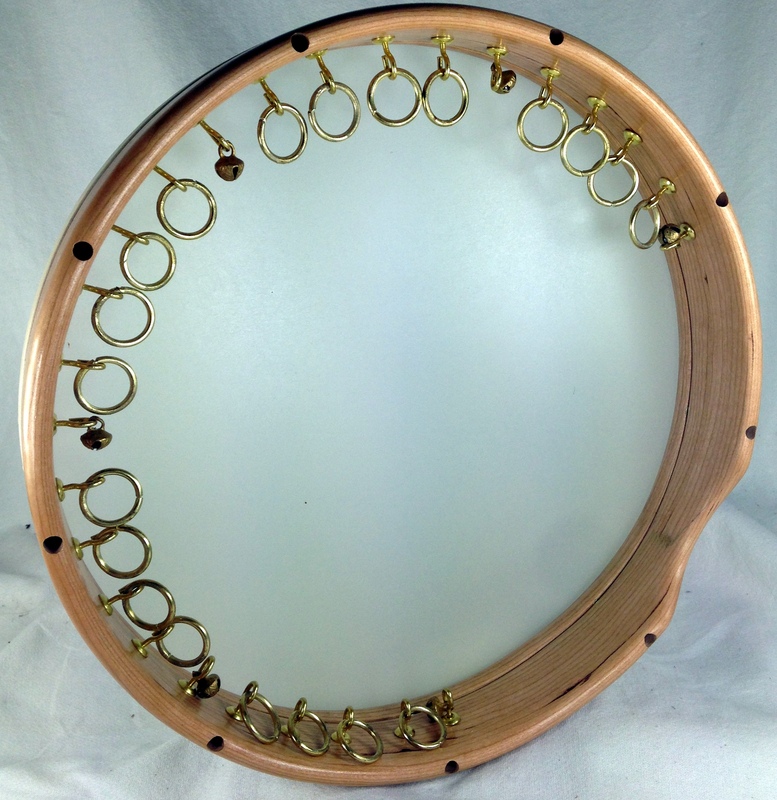 Handcrafted from a single ply of steam-bent Cherry, 14” diameter x 2.5” deep, paired with a REMO Renaissance drumhead, is accessorized with one fewer sets of rings – 5 sets of 4 ghaval rings (20 rings, total) and 6 pellet bells.